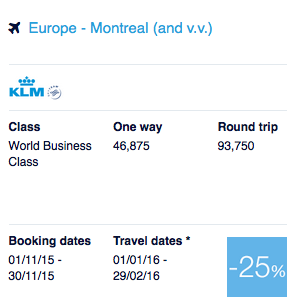 The newest set of Air France KLM's Promo Awards were released today but won't be bookable until November 1st (well 6pm EST on the 31st) The discount ranges from 25 to 50% off the regular amount of miles required. As you can see just by the discount this can be a very good offer if you get 50% off for Business Class! 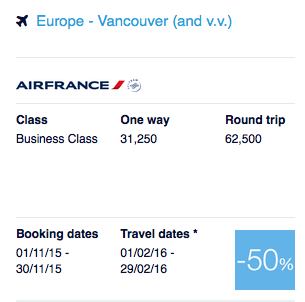 A nice change of pace this month with many more Canadian cities being included however the stand out is the 50% off Air France Business Class between Europe and Vancouver!!! At the 50% off you could actually make a real go of this offer with the Flying Blue Buy Points bonus that is on right now. We just detailed last week how it would save you money to buy points and fly business class between Vancouver and Europe with a 25% discount now that it has a 50% discount you'll save even more! 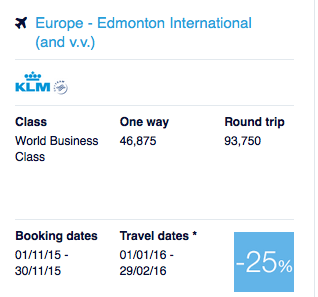 Now you can get that ~$4800 business class flight for just under C$2500!! !